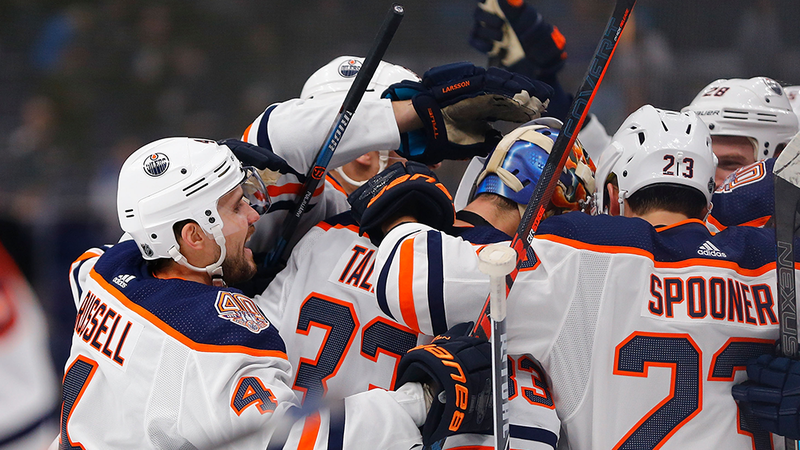 Oscar Klefbom tied the game with 56 seconds remaining in regulation and Connor McDavid (0-1—1) scored the decisive marker in the shootout to lift the Oilers to their second multi-goal comeback win this season. * Edmonton became the 17th club to accomplish a multi-goal comeback win on multiple occasions this season. Overall, this marked the 61st time in 2018-19 that a team rallied from a multi-goal deficit to win - the highest total through 428 games in any NHL season. * Klefbom continued his recent late-game heroics after his two prior goals this season were back-to-back game-winning tallies late in the contest, including an overtime winner in a 1-0 OTW vs. DAL (Nov. 27) and the go-ahead marker with 2:20 remaining in regulation in a 3-2 W vs. LAK (Nov. 29). * Klefbom scored the 14th game-tying goal in the final minute of regulation this season and first by the Oilers. The Blackhawks, Sharks and Ducksare the only clubs to score two such goals in 2018-19. Additionally, only two other defensemen have accounted for a game-tying goal in the final minute of regulation this season: Ryan Suter (Oct. 11 vs. CHI) and Roman Josi (Nov. 10 vs. DAL). * Cam Talbot turned aside 28 shots to halt a personal eight-game skid and earn his 100th win with the Oilers to become the fifth goaltender in franchise history to reach the milestone. * The Oilers own a 5-2-1 record since Ken Hitchcock took over as head coach on Nov. 20. Hitchcock, who served behind the Blues bench from Nov. 6, 2011 to Feb. 1, 2017 (248-124-41), improved to 45-28-10 in 83 career games against clubs he previously coached, including a 4-2-0 mark against the Blues. Joe Thornton (0-3—3) was one of three Sharks to post multiple points as the club improved to 4-0-1 in their last five outings vs. the Hurricanes. Thornton boosted his career totals to 401-1,138—1,439 to move within two helpers of tying Marcel Dionne (1,040) for 10th on the NHL’s all-time assists list. 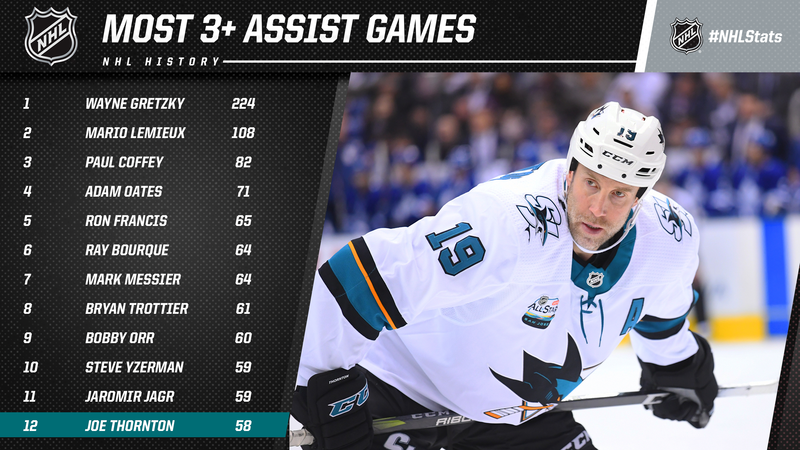 * Thornton recorded his first three-assist outing of 2018-19 and the 58th of his career. Only 11 players in NHL history have posted more such performances. Despite relinquishing a 2-0 lead, the Ducks (15-10-5, 35 points) benefited from third-period goals by Ondrej Kase and Jakob Silfverberg to earn their fifth straight win and move within one point of the idle Flames (17-9-2, 36 points) for first place in the Pacific Division. * Anaheim, who matched Toronto for the League’s longest active win streak, improved to 24-5-7 (55 points) at Honda Center in the calendar year. Only Winnipeg (27-7-3, 57 points), Nashville (27-10-2, 56 points) and Toronto (27-10-2, 56 points) have collected more points on home ice since Jan. 1. Auston Matthews and the Maple Leafs set their sights on a sixth consecutive win when Dylan Larkin and the Red Wings visit Scotiabank Arena. 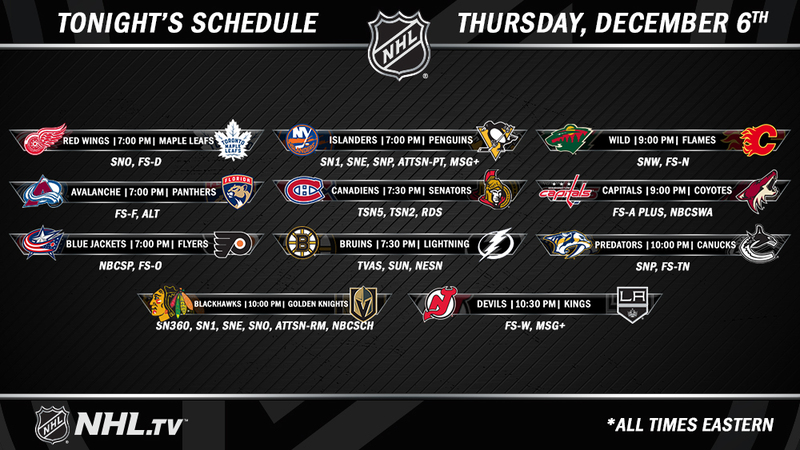 Toronto, who shares the League’s longest active run with Anaheim, aims to post a win streak of six games for the second time in as many seasons after recording an equal stretch from Nov. 6-18, 2017 en route to their best regular-season in franchise history (49-26-7, 105 points). * Matthews, who became the sixth different player since 1992-93 to record 15 or more goals through his first 14 appearances on Tuesday, has found the score sheet in each of his three games since returning to the lineup on Nov. 28 (5-2—7). Since he entered the League in 2016-17, only Alex Ovechkin (102), Patrik Laine (101) and Nikita Kucherov (91) have scored more than Matthews (89). * Mitch Marner enters Thursday’s contest with points in each of his last five contests (0-11—11) and leads the Maple Leafs with 6-33—39 in 28 GP this season. In the NHL’s expansion era (since 1967-68), only two different players in franchise history have recorded their 40th point in 30 or fewer team games: Doug Gilmour (28 GP in 1992-93 and 30 GP in 1993-94) and Darryl Sittler (28 GP in 1977-78 and 29 GP in 1976-77). * Fresh off netting his franchise-record sixth career hat trick Tuesday, Cam Atkinson leads the Blue Jackets into Philadelphia to face off against the Flyers in a Metropolitan-Division clash. Atkinson has collected (13-6—19) throughout the course of his 11-game point streak and trails only Ryan Johansen (13 GP in 2014-15) for the longest such run in Blue Jackets franchise history. * Washington’s Alex Ovechkin, who tallied his 20th goal of the season in his last outing, seeks to post a point streak of at least 10 games for the first time since Jan. 27 - Feb. 18, 2009. The reigning Maurice “Rocket” Richard Trophy winner currently sits at 4,999 career shots. Since 1959-60, onlyeight players have recorded 5,000 career shots with Ray Bourque topping the list (6,209 shots in 1,612 GP). * Colorado’s Mikko Rantanen has collected 4-13—17 over the course of his second nine-game point streak of the season (also 9 GP from Oct. 4-22). Rantanen, who aims to extend his current stretch to a career-high 10 contests, can post the NHL’s 10th such instance in 2018-19. * After posting a three-point outing in Florida’s shutout win Tuesday, Jonathan Huberdeau sets his sights on joining Auston Matthews (7 GP from Oct. 3-15) as the second player to record multiple points in seven straight games this season. Vincent Lecavalier (8 GP in 2008-08), Mario Lemieux (7 GP in 2002-03), Doug Weight (7 GP in 2002-03) and Pavel Bure (7 GP in 2000-01) are the only other players in the last 20 years to record multiple points in seven consecutive contests.